Foxnews.com reports on a dumb criminal they call the worst burglar ever. A hapless burglar is in jail after he allegedly ransacked a New Hampshire couple’s home, ate their leftover chicken wings and fell asleep. Renaud "Junior" Plaisir was charged with burglary after police say he slit a screen and then snuck into the Manchester home as the couple slept. He allegedly ransacked the house before taking his shoes off in the hall and then falling asleep in the guest bedroom. Resident John Terrell woke up and noticed the shoes outside of the bedroom. 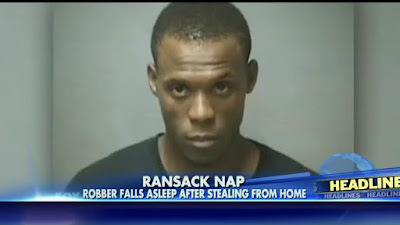 He then peeked in, where he found Plasir napping with a knife in his back pocket and the stolen goods surrounding him. Terrell held Plaisir at gunpoint while his wife, Elinor, called police. Plaisir is being held in jail on $25,000 bond. He was reportedly found with jewelry and credit cards in his backpack, likely from previous break-ins. I hope the idiot loves prison as much as some prisoners will love him.